WEST SALEM, Ohio — On Nov. 7, the Northwestern FFA traveled to Norwayne to participate in the district food science career development event. Members competing were Valaire Imhoff, Leeanna Ruegg, Clair Vaughan, and Haley Wilson. The team was second in the contest, and will be participating at the state contest. Four members were recently selected to win free FFA Jackets. Ari Borton, Jameson Holtz, Kara McKay, and Janna Ours were the selected members. These members, along with 107 other first-year FFA members from the state, were elected based on an application. This year, the jackets given to the Northwestern FFA Members were donated by Joe Hoerst, and Roger Wright. On Nov. 20, members competed in the sub-district parliamentary procedure contest and district job interview contest held at Smithville High School. Northwestern had a novice and a varsity team compete in the parliamentary procedure contest. The novice team of Jayden Berry, Ari Borton, Avery Garver (chairman), Jameson Holtz, Dugan McLaughlin (chairman), Kade Tegtmeier, Hanna Wilson and Carissa Winland placed first in the sub-district and advanced to districts on Dec. 3, at Northwestern High School. The varsity team consisted of Austin Beegle, Valerie Imhoff (secretary), Cody Morrow, Jordan Melegari, Riley Stull, and Brock Tegtmeier (chairman) with Alex Borton, Craig Wellert, Cole Wharton, and Haley Wilson as the team’s alternates. The team placed first overall and will compete in the district contest Dec. 3. The chapter also had four members compete in the district job interview contest. Members were senior, Cody Morrow; junior, Leeanna Ruegg; sophomore, Valerie Imhoff; and freshman, Jadeyn Berry. Cody, Leeanna, and Jadeyn placed second in their divisions and Valerie earned third in her division. MILLERSBURG, Ohio — On Nov. 20, the West Holmes FFA sent two officers to attend the annual Holmes Soil and Water Conservation District banquet at Carlisle Inn in Walnut Creek. The officers were Jayme Pennell and Rebecca Sprang. The SWCD board of supervisors conducted the annual meeting. The new supervisors were elected. After the dinner, farm tour essay winners were brought up to the stage and given prizes. This year’s topic was creative nonfiction. Then Hiland and West Holmes FFA recognized the individuals that won the poster contest. Each school had three different winners. For West Holmes, Aiden Noe placed third, Saige Krownapple placed second, and in first place we had Devin Miller earn first place. The poster contest revolved around the stations at the farm tour, as well as the West Holmes FFA Farm Safety Presentation. The evening continued with the retirement of supervisors, and concluded with a thanks to all of those who help support the conservation of Holmes County. On Nov. 27, the chapter sent members to Hillsdale High School to compete in the parliamentary procedure contest. The senior team consisted of President Chasidy Schmucker, Secretary Natasha Averbukh, Megan Brannon, Anna Irwin, Laura Irwin, Kylie Ramirez, and Maddie Stitzlein. They placed second, and will proceed to districts on Dec. 4. The junior team consisted of Cora Crilow, Ally Ogi, Abby Waers, Julia Miller, Kyle Mowery, and Samantha Kendall. They placed second overall and will also advance to the district contest at Wynford. CRESTON, Ohio — Norwayne FFA held its ninth annual fall benefit Nov. 17 at Norwayne High School. The benefit this year was for Noelle Wingate. Noelle is a third-grader at Norwayne Elementary School and enjoys My Little Pony and princesses. She started her medical journey at three months old, when she was diagnosed with biliary atresia and the cure was to get a liver transplant. She waited 19 short hours for a liver that was available for her body. Today, she is at risk of getting other diseases such as cancer, but for now, she is healthy. When sickness hits, such as a cold or flu, it hits hard for Noelle. This year our chapter raised over $20,000 for Noelle and her family to be able to pay off some medical expenses. At the benefit we had a live auction, dinner, volleyball tournament, and silent auction to raise money. EDON, Ohio — Five members of the Edon FFA chapter competed in the sub-district job interview career development event on Nov. 7. The job interview contest is designed for FFA members to practice and demonstrate the skills needed in seeking employment in all areas of agriculture. Students complete a resume, cover letter, job application, interview with judges, and compose a follow-up letter. In division one, Emma Howard placed third; in division two, Addison Harding placed second and Paige Briner placed third; in division three, Arianna Howard placed third; and in division four, Taylor Brown placed second. Addison and Taylor qualified for the district competition on Nov. 13, where they placed third and ninth respectively. 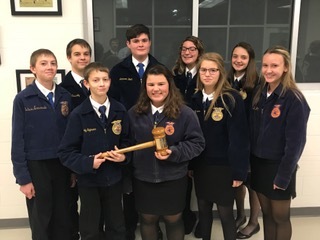 The Edon FFA was represented at the sub-district parliamentary procedure contest Nov. 19, by a novice and advanced team, and both placed first. Members on the novice team were Gage Winebernner, Olivia Mitchell, Kerrin Towers, Carlie Kiess, Heavenlee Owens, Trenton Arnold, Breanna Heinze, and Drew Gallehue. Members of the Advanced team were Aidan Muehlfeld, Addison Harding, Alea Brandt, Tatum Schaffter, Connor Skiles, and Shane Zulch. The advanced team also competed at the district level on Nov. 26, where they placed fourth. 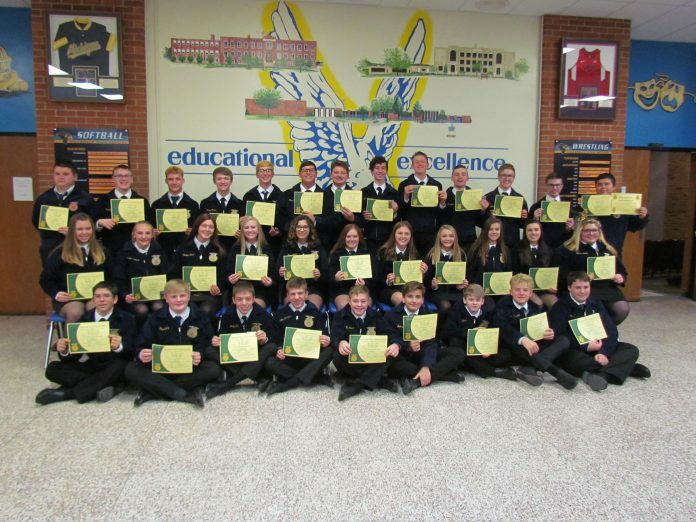 JEROMESVILLE, Ohio — On Nov. 14, 36 members of the Hillsdale FFA received their greenhand and chapter degrees. The ceremony took place at 7:30 p.m and was led by the officer team. The guest speaker was Mallary Caudill, Ohio’s State FFA Sentinel. The ceremony consisted of the recognition of all members who attained the requirements necessary to receive the greenhand and chapter degrees. During the ceremony, the members received pins and a certificate saying that they had met all the requirements needed to acquire their degree. Jesse Zimmerman was awarded FFA member of the month. The chapter recognized Christopher Hammond, for winning the FFA jacket, for being the first greenhand member to memorize the entire FFA Creed. The Hillsdale FFA officer team held its annual pie action. All of the proceeds from the auction go towards the Senior FFA Scholarship fund. The chapter raised $1,410. CHILLICOTHE, Ohio — Fourteen members of the Zane Trace FFA chapter recently attended the Ohio FFA State Officer Leadership Night held at Amanda Clearcreek High School Nov. 14. During the event, members were led in four different activities that encouraged them to work together in teams and interact with the nearly 300 other FFA members in attendance. Lessons in communication and successful teamwork were emphasized. After the lessons members enjoyed dinner provided by the Amanda Clearcreek FFA. On Nov. 16, five members of the Zane Trace food science class traveled to Ohio State University to meet with Dr. Monica Giusti, Dr. Luis Rodriguez-Saona and Greg Sigurdson, doctorate student in food science. The students presented the three faculty members with their research proposals that related to food science issues and received guidance on how to conduct their experiments. The students were excited to learn that the topics they had chosen, which included the possibility of sourcing protein from insects; testing natural food coloring agents and examining the impact of soil type on soybean nutrient value were all related to current trends in food science. The students had the opportunity to tour the lab areas in the food science building and learn how various instruments such as a colorimeter, spectrophotometer and rotary evaporator are used to analyze food.